Are you ready for a bathroom renovation at your home in the Scottsdale, Arizona, area but aren’t quite sure what you’d like to have included? Fortunately, the sky is the limit. Before we review some ideas, you should take a moment to decide what will truly make you happy with a new bathroom. For instance, how do you like to relax at the end of the day? Do you prefer to set the mood with soft LED lighting as you soak in a walk-in tub with massage jets? Or is unwinding in a steam shower more your style? Updating your tub or shower is a key component of a bathroom renovation, and you want to be sure that you’re happy with the end result. Of course, updating your bathing area doesn’t have to be extravagant. If you have a bathtub and you’re more of a shower person, a tub-to-shower conversion can certainly be a part of your bathroom renovation. If you’d like a more open floorplan, consider a shower splash wall. Not only will this eliminate the tub, but it also removes the shower door – one less thing for you to clean! – to expand the space in your bathroom. Are you tired of sharing a sink with your spouse? How about twin sinks with touchless faucets set in a gorgeous marble countertop? Complete the look with matching cabinets and a beautiful tile floor. Bottom line: your bathroom renovation in Scottsdale, AZ, should be all about you. Homeowners in Scottsdale, AZ, and surrounding areas can turn to Premier Kitchen & Bath for their bathroom renovation project. We have professional designers on staff who will be glad to take your vision and add their own ideas to provide you with a stunning new bathroom that will go above and beyond what you thought was possible. 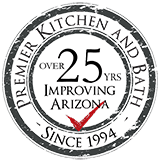 To speak with a representative, contact Premier Kitchen & Bath today. How Many Remodeling Contractors Do You Need to Hire for Your Scottsdale, AZ, Home Renovation Project?